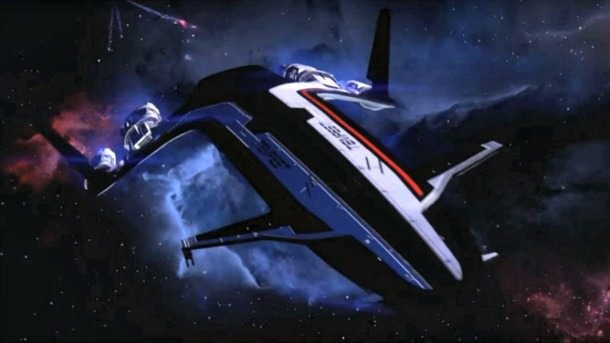 Tempest is the name of your ship in Mass Effect Andromeda. The Tempest is a fleet, scout ship that will be your transportation from the Nexus to the numerous planets and Locations you'll be exploring. The Tempest is a speed specialist that can travel 13 light years per day. Players will be able to seamlessly travel between the locations of the ship without load screens. Characters will continue to be found aboard the ship in their own areas but they will move about in that general area and will do different things. It will have more activity and less static, predictable movements. As in past games, characters will react to you with dialogue related to Missions you've just completed. Players can modify their Weapons and Armor loadout, change their squad up and manage Cryo Pods as they do on the Nexus. This is where the ship's pilot steers the ship and where the Pathfinder operates the nav system, synced specifically to them. The foremost section of the ship, the bridge also has a wide viewing area displaying the universe ahead. The bridge is the important command center where you will mostly handle navigation. Rather than choose a Location from a galaxy map, you will look at the stars ahead of you while on the bridge to select your destinations. The galley is an atrium-like area where Ryder can modify Powers. The galley functions as the ship's kitchen and dining facility. An L-shaped seater with a table opposite the cooking area plus a couple of swivel chairs forms the room's structural arrangement. Research and Development is where the team will gather intel and work on practical application to Crafting upgrades Weapons, Armor and the Nomad. Practical applications of intel and samples gathered like upgrading weapons, armor, and the Nomad ND1 are done in the research room, supported by discoveries from the ship's tech and bio labs. It is situated at the ship's approximate center, between engineering at the aft and the tech and bio labs at the fore. Technological items are sequestered and studied at the tech lab. It is located just opposite the bio lab in the fore section of the ship. The bio lab has containment and analysis facilities for biological samples like plants. It is located just opposite the tech lab in the fore section of the ship. The Meeting Room provides a place for the crew to gather or conference with the Nexus. Below the meeting room is the engineering room, housing the starship's drive core. Also below the meeting room is the Pathfinder team's armory, where weapons are stored while off-mission. Another facility below the meeting room, the med bay has beds armed with a variety of medical equipment to diagnose and treat potential injuries. The cargo bay houses the Nomad scout rover. It opens up the underbelly of the Tempest to deploy the vehicle or the ground team itself on a ramp. The ship features Crew Quarters for some rest and relaxation. The crew are housed in wall-set two-man bunks in an area with ample space and greenery. The Pathfinder's cabin is generally off-limits to the crew unless invited inside. It is the exclusive abode of the ship's commander. Amenities present include a sitting room, a window to (or a projection of) space taking up an entire side, and far larger living quarters compared to the crew's. Players will have some control over decor as the game progresses such as mementos and souvenirs. The pilot is a Salarian named Kallo Jath. 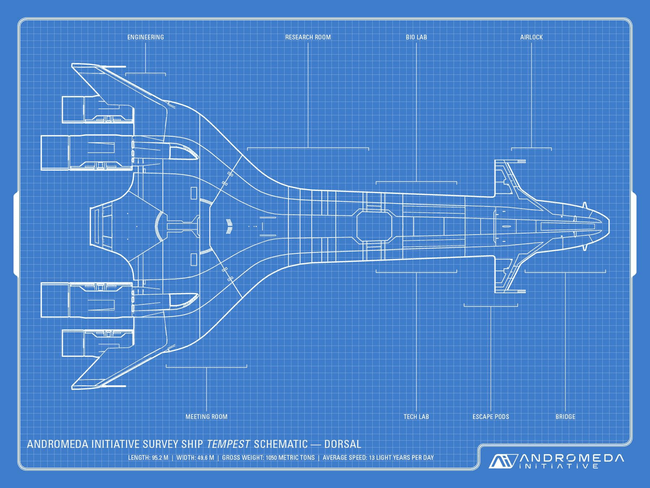 The Tempest is a scouting ship, and as such, reflects a sleeker look than the Normandy had. What you see from the windows of the ship will reflect your location in space will change as you travel the galaxy. If you are approaching a planet, you will be able to see that planet from the windows. Selecting a planet to explore will have minimal loading. Navigating, landing and exploring via the Nomad will all happen much more seamlessly than in past games. Players will not be able to manually fly the Tempest.